For the DC tweet-up, we had 5 RSVP in advance. One ended up not making the trip down from Baltimore (though we have planned for a Baltimore area meet up to follow after the holidays!) and two of the others never made it to the official WAVE table. To be fair, it’s quite possible they were at the pub. 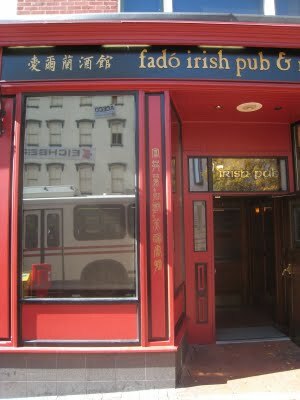 Fado is located less than a block from the Verizon Center and the Washington Capitals were playing the Toronto Maple Leafs at home Friday night. Suffice to say, the pub was HOPPING all night long! In the end, my partner in crime (Betsy Hiner, a Baltimore County middle school music teacher and “tech liaison” for the school) and I handed out WAVE fliers to the ladies in the crowd, met some great people, had some great conversations – in real life in the pub, as well as among the WAVE members tweeting throughout! – and enjoyed some fantastic food. (If you ever visit Fado, let me highly recommend the Black & Tan Brownie with Guinness Ice Cream. YUMMO!) Plus, the Caps won their game and before we left, the crowd at the pub tripled in time for the DJ to kick off the ‘late night’ events. I know several of the other cities had a very large turn out and I look forward to hearing run-downs from those places – in particularly Gina Sansivero’s happening NYC event and the crazy WAVE party in Minneapolis that apparently started several hours early. Thanks again to Jennifer Willard and Kelly Perkins for getting WAVE off the ground; to Sara and the rAVe crew for being great supporters of the group and the tweet-up; and to Gary of rAVe and NEC for providing an LCD TV as a giveaway for the event. Congrats to @Vaddio_Hailey for winning the big prize! You go, girl! As for me, I enjoyed the event – small though it was, in DC – and look forward to future WAVE tweet-ups and online discussions… as well as a WAVE party at Infocomm come June? *coughHintHintcough* Until then, thanks for a great kickoff to the weekend and the holiday season, ladies! Slainte!